Access and interact with all of your loan officer pipelines! The Enterprise Pipeline Manager will provide you instant access to the individual pipelines of your loan originators associated with the Virtual Lender Enterprise System. From the Pipeline Manager you can view all the applications in a centralized location and perform such functions as Pull Credit, Download Applications, Update Borrower Data and more. 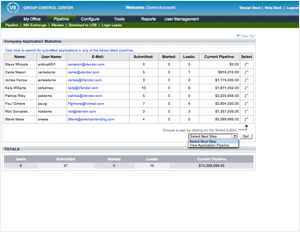 The administrator can also aggregate and manage pipeline for distribution to centralized processing for both the secure express and 1003 loan originator site applications while monitoring website activity and currently loan application statistics. Can I move applications from one account to another? YES! In the event that a loan officer leaves your company (or other reason) and you need to re-assign their applications to another user on your system you can easily select the applications and with a click of the button re-assign them.